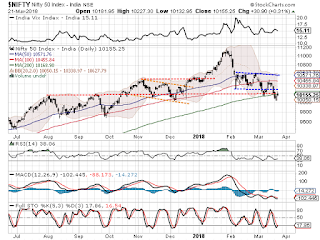 In what seemed to be a strong and sustainable pullback on Wednesday, the NIFTY failed to sustain above the 200-DMA levels. The intraday gains fizzled out and Markets came off significantly from the high point of the day. After great amount of volatility, NIFTY ended the day with a modest gain of 30.90 points or 0.31%. 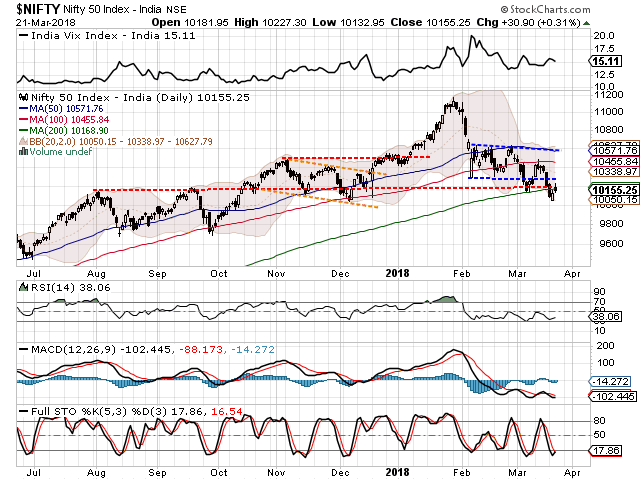 The NIFTY has resisted to the 200-DMA at Close levels after breaching that level a day before. The levels of 200-DMA will continue to pose a threat to the NIFTY in the immediate short term. Going into trade on Thursday, we expect a similar behavior from the Markets. A modestly positive opening to the trade is expected once again but it would be imperative for the Markets to move past the 200-DMA mark which stands at 10168. Longer the Markets remain below 200-DMA, more vulnerable it will remain to the selling bouts. Thursday will see the levels of 10170 and 10245 playing out as immediate resistance area for the Markets. Supports come in at 10040 and 9980 zones. The Relative Strength Index – RSI on the Daily Chart is 38.0574 and it remains neutral showing no divergence to the price. Daily MACD continues to remain bearish while trading below its signal line. No significant formations were seen on the Candles. Going by the pattern analysis, it is seen that the NIFTY did breach its 200-DMA levels at Close a day before but stayed within its filters. A pullback was attempted but it resisted at the 200-DMA which it had marginally breached in the previous session. Overall, NIFTY still continues to remain on tenterhooks on expected lines. It would be important for the Markets to move past and sustain above the 200-DMA at the earliest to form a temporary bottom once again. Staying below the 200-DMA for long will increase the vulnerability of the Markets for some more weakness. However, the oversold nature of important oscillators on both Daily and Weekly Charts point towards larger chances of a technical pullback. While remaining moderate on the overall positions, continuance of a cautious outlook is advised for the day. Fresh longs were seen being added in stocks like JSW STEEL, DLF, PFC, RPOWER, BHARTI AIRTEL, RECLTD, ITC, NTPC, ASHOK LEYLAND, MARICO, ONGC, RELIANCE CAPITAL and RELIANCE INDUSTRIES.